Freddie Mac (OTCQB: FMCC) today released the results of its Primary Mortgage Market Survey® (PMMS®), showing average fixed mortgage rates falling for the third consecutive week following disappointing April employment data. Mortgage rates are at their low point for the year. This entry was posted in Katonah and tagged Katonah NY, Katonah NY Homes, Katonah Real Estate for Sale on May 12, 2016 by Robert Paul. U.S. house prices accelerated further in April, as low inventories and growing sales push costs higher, a leading data provider said Tuesday. CoreLogic reported a 2.7% monthly advance to take the year-on-year gain to 6.8%. The spring is traditionally the strongest portion of the year for housing, and data from CoreLogic and other providers suggest an upturn. “Old-fashion supply and demand, fueled by historically low mortgage rates and improving consumer finances and confidence, continue to push home prices up,” said Anand Nallathambi, president and CEO of CoreLogic. Dallas and Houston prices are showing few signs of let-up despite the collapse in energy prices. Dallas prices were up 10.3% in the 12 months to April, and Houston prices were up 9.5%. The Washington, D.C., area brought up the rear with just a 1.6% advance. South Carolina was the strongest state, with an 11.4% advance, while Massachusetts saw a 1.7% drop, one of only four states to register a decline. CoreLogic is the first of the three major house-price trackers to report results. The Case-Shiller/20-city composite rose 5% in the year to March, and the FHFA house price report showed a 5.2% gain in the 12 months to March. This entry was posted in Katonah, Lewisboro and tagged Katonah Homes, Katonah Luxury Real Estate, Katonah NY on June 2, 2015 by Robert Paul. Headed to the city? We’ve got markets there, too. CLICK HERE for details. Calling all kids who like to dance and sing: You are in for a treat. Larchmont-based singer, Armelle Gloaguen, and her band, The Hand Jive Tribe, know how to get kids moving and grooving to music from around the world. She sings in English, French, Spanish, Korean, Chinese, and in a Sierra Leone dialect. They’ll play from 10 am to noon – see you there! This Saturday, join us for the Shovel Ready String Band! This local band knows how to celebrate the joy of bringing people together at the market. They play bluegrass, country blues, snappy good time tunes – and more – so make sure to stop by between 10 am to noon to enjoy their sound. Wednesday, February 11th from 7-9 pm. Each class is $15 or $40 for three. For additional events, visit our Down to Earth Markets Event Calendar. and follow us on Instagram and on Twitter @DowntoEarthMkts. *Vendors who rotate through various markets during the season. This entry was posted in Katonah, Lewisboro and tagged Katonah Homes, Katonah Luxury Homes, Katonah NY, Katonah NY Realtor on February 5, 2015 by Robert Paul. Vendors Offer Yummy Specials in both Ossining & Mamaroneck! This Saturday, January 31st, enjoy music by guitarist Ed Packer from 10 am to noon. He‘s a farmers market favorite with both his original and fun cover songs! This entry was posted in Katonah, Lewisboro and tagged Katonah Homes, Katonah Luxury Homes, Katonah NY, Katonah NY Realtor on January 29, 2015 by Robert Paul. Filing a single homeowner’s insurance claim can raise consumers’ annual insurance premiums by more than 30 percent, or hundreds of dollars each year, according to research by insuranceQuotes.com, a subsidiary of Bankrate Insurance. Nationally, one claim leads to an average premium increase of nine percent. The states with the highest single claim increases are Wyoming (+32%), Connecticut (+21%), Arizona (+20%), New Mexico (+19%) and California (+18%). In Texas, home insurers are not allowed to increase premiums after one claim. The next-lowest increases were observed in New York (+2%), Massachusetts (+2%), Florida (+3%) and Vermont (+4%). A second claim brings the national average increase up to 20% (the highest increase from a second claim was Michigan’s 71%). Nationally, liability claims are most likely to cause the greatest premium increases. A single liability claim causes premiums to rise by an average of 14%. Theft, vandalism and fire are not far behind. Medical claims (+2%) are the cheapest. This entry was posted in Katonah and tagged Katonah Homes, Katonah Luxury Homes, Katonah NY on October 21, 2014 by Robert Paul. Choosing a home in a hot New York City real estate market can be daunting. With the market being so high, should you rent or buy? We turned to licensed broker Daniel Nassi for some help. He said inventory is out there, so it “really comes down to whether you have the money or not.” Nassi said mortgage rates are comparatively low, which could make buying a better investment than renting. But if you need financing, you may be at a disadvantage. A number of cash buyers are in this market and they have a leg up. As for rents, prices are high and aren’t moving. Douglas Elliman’s monthly report breaks down rents throughout the city. The median in northwest Queens is about $2,700, Brooklyn just over $2,800, and Manhattan gets an average of $3,175. Nassi showed us a one-bedroom apartment in his building at 220 Park Avenue. 650 square feet will go for $3,500 to $3,600. “If you rent, you might be spending more money than if you buy,” said Jennifer Gould Keil, the celebrity real estate columnist for the New York Post. She said whether you’re renting of buying the best deals are in Midtown West and the Upper East Side. Do your homework, get to know the neighborhood, and visit it at all times of day. New Yorkers we spoke with watch the market closely. “Owning is always good, real estate always goes up so owning would be good for anybody,” Romain Singh said. “When I bought my property it was many years ago, so it was so much cheaper, but now the prices has escalated that it’s impossible to buy,” Cleonie Sinclair said. The real estate market does tend to slow down in the fall, especially around the holidays. You may have fewer options, but it could be a good time to negotiation. This entry was posted in Katonah, Lewisboro and tagged Katonah Homes for Sale, Katonah Luxury Homes, Katonah NY, Katonah NY Homes for Sale on September 25, 2014 by Robert Paul. Freddie Mac (OTCQB: FMCC) today released the results of its Primary Mortgage Market Survey® (PMMS®), showing average fixed mortgage rates making their biggest one-week gain so far this year and bringing them to their highest level since the week ending May 1. 30-year fixed-rate mortgage (FRM) averaged 4.23 percent with an average 0.5 point for the week ending September 18, 2014, up from last week when it averaged 4.12 percent. A year ago at this time, the 30-year FRM averaged 4.50 percent. 15-year FRM this week averaged 3.37 percent with an average 0.5 point, up from last week when it averaged 3.26 percent. A year ago at this time, the 15-year FRM averaged 3.54 percent. 5-year Treasury-indexed hybrid adjustable-rate mortgage (ARM) averaged 3.06 percent this week with an average 0.5 point, up from last week when it averaged 2.99 percent. A year ago, the 5-year ARM averaged 3.11 percent. 1-year Treasury-indexed ARM averaged 2.43 percent this week with an average 0.4 point, down from last week when it averaged 2.45 percent. At this time last year, the 1-year ARM averaged 2.65 percent. This entry was posted in Katonah, Lewisboro and tagged Katonah Homes, Katonah Luxury Homes, Katonah NY, Katonah NY Real Estate on September 18, 2014 by Robert Paul. Followers of the housing market got spooked a couple weeks ago by some data suggesting the market was in trouble. First, the recent pending home sales data from the National Association of Realtors showed a 1.1% decline, when economists had forecast a 0.5% increase. Second, the S&P Case-Shiller 20-city house price index declined 0.3% on a monthly basis, when economists had predicted a 0.4% increase. Is it game over for the U.S. housing market? There’s no doubt that the housing market has slowed from the strong growth it saw in 2013, but that doesn’t mean it’s about to crash. On the contrary, there are four key reasons the market is likely to improve. First, despite the talk that rising mortgage rates will choke off demand, housing still remains relatively affordable. 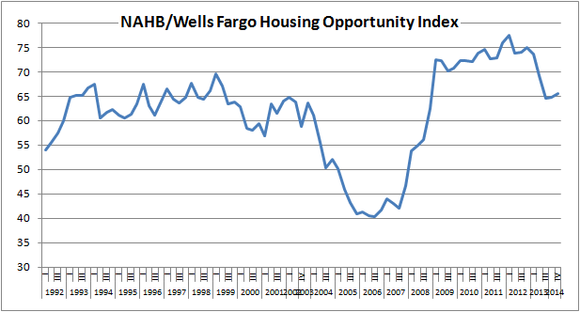 Take a look at the National Association of Home Builders/Wells Fargo housing opportunity index — the higher the number, the more affordable housing is. Affordability fell in the second half of 2013, but on a historical basis, it’s still supportive of good growth in the housing market. Readers can see that, according to the index, housing is more affordable than it was for most of the 1992-2009 period. This entry was posted in Katonah, Lewisboro and tagged Katonah Homes for Sale, Katonah Luxury Real Estate, Katonah NY, Katonah NY Real Estate on August 12, 2014 by Robert Paul.